A remarkable 99% reduction in the number of albatrosses that are accidentally injured and sometimes killed by trawlers proves that the fishing crews who work in South Africa’s deep-sea hake fishery are well trained in responsible fisheries practices and very serious about constantly improving the environmental performance of the fishery, says SADSTIA executive secretary, Roy Bross. Bross was commenting on the paper “Significant reductions in mortality of threatened seabirds in a South African trawl fishery” which was published recently in the respected scientific journal Animal Conservation. 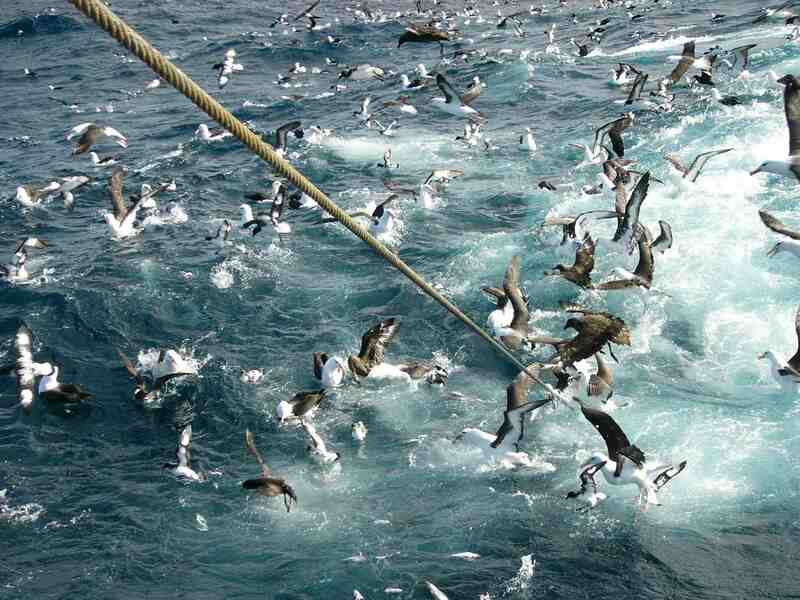 The paper has attracted attention in both conservation and fisheries circles because it shows that over seven years, interactions between seabirds and trawl gear have dropped dramatically as a result of the deep-sea trawling industry’s consistent use of bird scaring devices. 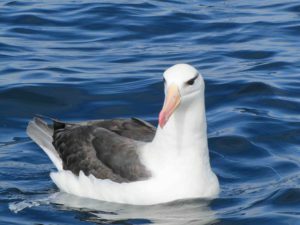 “It is particularly pleasing to note that the black browed albatross, the most iconic of the seabirds in South African trawling assemblages, has been downlisted to “Near Threatened” on the IUCN Red List of Threatened Species because it has been observed to be getting on nicely,” says Bross. 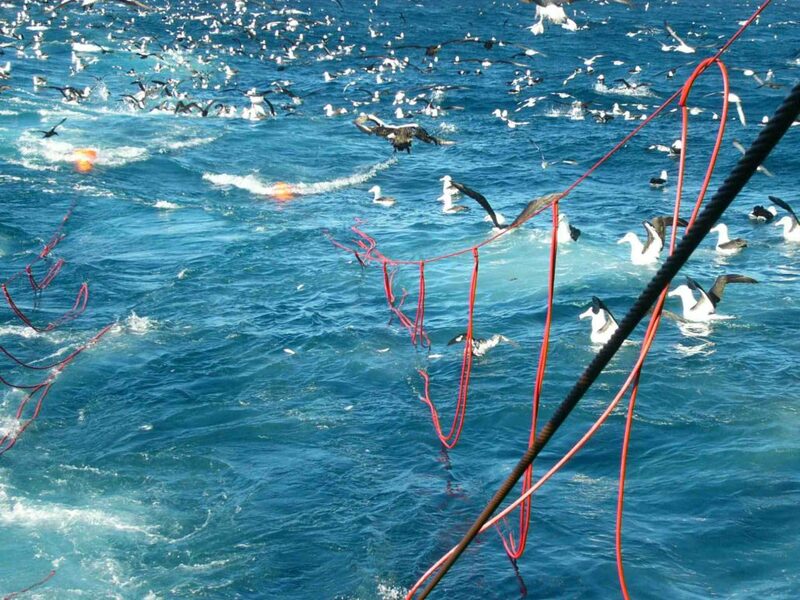 Bird scaring devices, which are called “tori lines” (tori being the word for “bird” in Japan), have been routinely deployed by South African deep-sea trawlers since 2006. The lines consist of a length of rope from which six to ten brightly coloured streamers are hung. The streamers flutter in the wind and are effective at scaring birds away from the stern of a fishing vessel where they may be accidentally killed or injured when they collide with trawl warps – the strong braided wire ropes used to tow the trawl net. “The bird scaring lines are seemingly easy to deploy, but to be effective they have to be individually set up for each vessel, or class of vessel, and they must be correctly deployed immediately after the trawl doors have been lowered to the water,” says Bross. According to Bross, the results published in the Animal Conservation paper demonstrate that members of SADSTIA are willing to work with scientists and conservationists to ensure that trawling activities cause as little harm as possible. He emphasises that education is a vital part of such partnerships because the solutions demand constant care, attention to detail and dedication from the trawling community; it is very important that fishing crews understand the reasons for what they are doing. Originally, longline and gillnet fisheries were seen to pose threats to seabirds. Foraging albatrosses and petrels often become hooked or snarled in lines when they flock around fishing boats, searching for scraps or, more frequently, “stealing” bait. Gannets and other diving seabirds are frequently enmeshed in static nets. Prior to 2014, nobody had thought that trawling posed a seabird mortality problem, but in that year, Birdlife International discovered seabird kills were indeed a problem in trawl fisheries off the Falkland Islands – and by implication in other Southern Hemisphere trawl fisheries too. The South African hake trawl fishery was first certified as sustainable and properly managed by the Marine Stewardship Council (MSC) in the same year as the Falkland discovery, and, as a condition of certification, SADSTIA was encouraged to investigate the nature and scale of seabird mortality. WWF and Birdlife SA soon demonstrated that seabird interactions did occur in South African trawl fisheries. The high rate of seabird deaths surprised even the most experienced skippers and deckhands: it was difficult to see the birds flying into the warps and hardly any injured or lifeless birds were retrieved by fishers; it was only when the occurrences were captured on film that scientists and the trawling industry, understood the degree to which trawl fisheries were also contributing to the global decline of seabird – and especially albatross – populations. 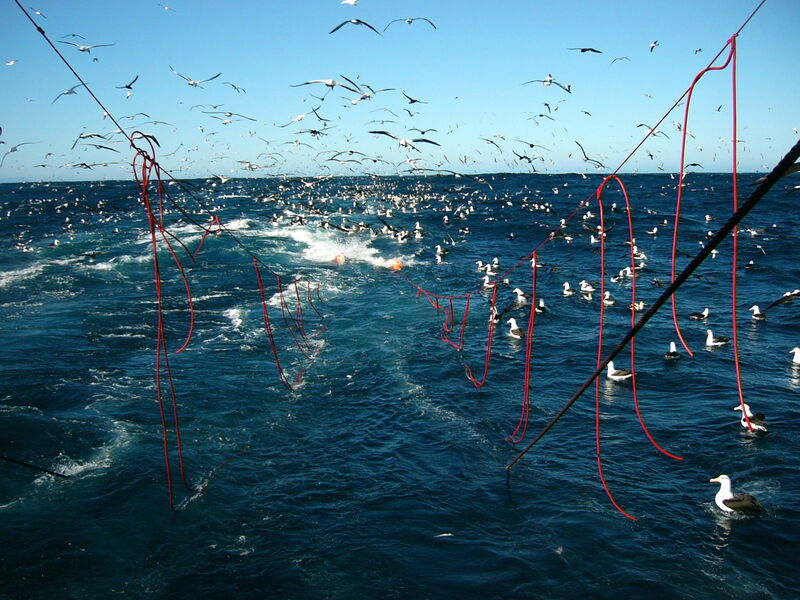 Today, exacting tori line regulations form a major part of a suite of management interventions that include a standard for coating trawl cables with lubricants; a requirement to trim cable joins, a ban on releasing offal during winching and the development of individual bird management plans. “Bird-scaring lines (are a) trivial expense per vessel for a measure that reduces fatal interactions with threatened seabirds so effectively. Our results provide a strong case for the mandatory adoption of bird-scaring lines in trawl fisheries with high densities of scavenging birds,” say authors, Bronwyn Maree and Ross Wanless of Birdlife South Africa, Tracey Fairweather of the Department of Agriculture Forestry and Fisheries, and international contributors, Ben Sullivan and Oliver Yates. One of the reasons why scientists are so concerned about seabirds is that albatrosses and petrels migrate over vast distances, often circumnavigating the globe. Each bird has a chance of dying in one of a number of different fishing regions globally, making it all the more difficult to get a good grip on mitigation. Another reason is that albatrosses are long-lived birds that don’t breed prolifically, and not until they are at least seven years old. It is very important to ensure that they have a chance to reproduce as many times as possible and that their lives are not artificially shortened by careless fishing practices. Maree, B.A. ; Wanless, R.; Fairweather, T.P. ; Sullivan, B.J. & Yates, O. 2014. Significant reductions in mortality of threatened seabirds in a South African trawl fishery. Animal Conservation. ISSN 1367-9430. London, United Kingdom. The Zoological Society of London. Read more about SADSTIA and seabirds. A feeding frenzy gathers around the trawl warps when a tori line has not been deployed (photo: Birdlife SA).